This event is sponsored by Tsechen Chokhor Ling, a Sakya center located in Arcadia, California. Ven. 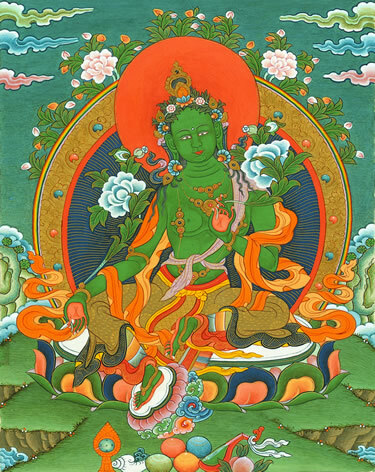 Lama Kunga Rinpoche will kindly offer the empowerment of GREEN TARA in the Atisha tradition. This event is sponsored by the sangha members of Tharpa Cho Ling, the retreat center of Ewam Choden in Upper Lake, CA. Everyone is welcome. The empowerment may be received with the intention of practice or only as a blessing. A sadhana for practice will be available. Also, Ven. Lama Kunga Rinpoche will give a Buddhist refuge ceremony to newcomers. Requested Donation is $25.00. Dana (offering) to the Lama is separate. For further information, please contact Max at 707-275-9435. Green Tara ((Drolma སྒྲོལ་མ, in Tibetan) is a Bodhisattva of enlightened activity and purified energy. Khenpo Migmar Tseten will kindly explain the profound meanings of two essential Buddhist texts—the Heart Sutra, which underlies the Mahayana path, and the Four Noble Truths, the basis for all Buddhism. These events are suitable for everyone and open to the public. They are an excellent introduction to Buddhist philosophy and views for beginners, and an opportunity for practitioners to reinforce and deepen their understanding. The Heart Sutra is the most important Mahayana wisdom training of the Buddha. The Sutra explicitly explains the ultimate truth of emptiness and implicitly shows the graduated path of meditation to go beyond samsara and nirvana. Learning the Heart Sutra also helps to perfect the Mahayana and Vajrayana sadhana practice. Khenpo Migmar will explain the essence of The Heart Sutra based on his forthcoming book, The Wisdom Gone Beyond. Saturday, August 16th–from 10:00 a.m. to 4:00 p.m. There will be a break for lunch with some snacks provided by the Center and potluck from people attending. Requested donation of $50. for the day. Dana (offering) to the Lama is separate. The Four Noble Truths are regarded as the central teaching of the Buddhist tradition and provide the framework upon which all other Buddhist philosophy and meditation are based. These Noble Truths are the truth of suffering, the origin of suffering, the cessation of suffering, and the path leading to nirvāṇa. Although we may already be familiar with this core doctrine, by repeatedly studying the Four Noble Truths and their sixteen corresponding aspects, our realizations on the spiritual path can become more transformative and profound. To further study about the Four Noble Truths, please read Lama Migmar’s newest book Awakening to the Noble Truth, which can be purchased on Amazon. Sunday, August 17th—from 1:00 p.m. to 4:00 p.m. Requested donation of $30. for the afternoon. Dana (offering) to the Lama is separate. He is the author, editor and translator in a series of four Vision books and of the Treasures of the Sakya Lineage. His newest book, just published last month, is called Awakening to the Noble Truth. It’s a teaching on the Four Noble Truths and the Noble Eightfold Path. Ven. 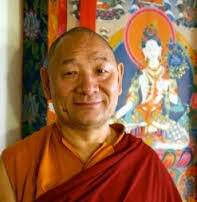 Lama Kunga Thartse Rinpoche will kindly offer the three empowerments known together as the Rigsum Gompo. They are Vajrapani, Manjushri, and Avalokiteshvara. The empowerment of the three Bodhisattvas will be given in a special one-day Rigsum Gompo empowerment. The empowerment will be followed by a special teaching on the Sadhana practice by Lama Kunga Rinpoche. DAY AND TIME—Sunday, September 28, 2014 at 1:00 pm Please come early to register. The donation for the day is $60 and $45 for Ewam Choden members. Dana (offering) to the Lama and monastic helpers is separate. Please be considerate of neighbors when parking in the area.